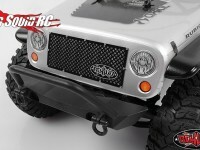 jeep rubicon « Big Squid RC – RC Car and Truck News, Reviews, Videos, and More! You are browsing the "jeep rubicon" tag archive. Hey guys, Adam the intern here with a review of Axial’s 2012 Jeep Wrangler Unlimited Rubicon Kit! I put it though some serious tests to see what it was made of and had some interesting results… Press READ MORE to see my complete thoughts.